Hay has surrounded himself with some talented musicians including Michael Georgiades on guitars (who also wrote one of the songs), Jeff Babko on piano and organ, and Cecilia Noel on backing vocals (she also co-wrote the title track with Hay). In addition, Hay plays a mean harmonium and banjo. Listen to Gathering Mercury in its entirety HERE. Thanks, nice article. I never would have thought about the McCartney/Harrison comparison, but it totally fits makes sense. I’ve been listening to GM almost daily since it’s release, and I my appreciation and love for this record has not stopped growing yet. It gets my vote for Colin’s best yet, and I hope there is much more to come. My wife and I had the pleasure of seeing Colin live at the Belcourt in Nashville a couple of years ago. He is truly a master troubadour and deserves far more notice than that which he receives. 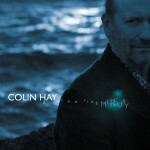 I hadn’t heard of Colin Hay since Men at Work…and I got to see him just recently at the Woodford Folk festival…..he was AWESOME ….I bought his album and loved it straifgt away….which since then, I now want to hear all of his music….What a true artist and musician….! Absolutely beautiful and thought provoking….